Azure provides global scale cloud computing running in Microsoft Datacenters in over 40 regions. Azure Stack extends the value of Azure to a wider range of customers and scenarios by making a core set of services available to run on integrated systems running in customer’s or service provider datacenters. Many companies and service providers are evaluating Azure Stack Development Kit (ASDK) to learn more. Many of these companies are going beyond evaluation and thinking through strategy, design, and implementation of a hybrid cloud for modern apps and on-premises cloud services. Business continuity and disaster recovery (BC/DR) planning is an important part of a comprehensive strategy. Have you downloaded and installed ASDK? Download it now. Business continuity and disaster recovery planning are closely related processes that a company uses to prepare for unforeseen risks. In this post, we’ll go through the protection objectives for different application types and recovery objectives so you can think about solutions that meet your business needs. These objectives will have a direct impact on the BC/DR strategy that you choose. Protect the underlying infrastructure that hosts IaaS virtual machines, PaaS services, and tenant applications and data. Protect IaaS-based applications and data. Protect PaaS-based applications and data. Archive PaaS data for long-term retention. This blog focuses on the second point: protecting IaaS virtual machine-based applications and data using Microsoft and partner products for backup and restore, and replication and failover. The Azure Stack team is engaged with multiple partners to ensure that their third-party solutions work on Azure Stack. Expect additional blog posts covering the other three areas in the near future. Azure Stack supports Windows- and Linux-based applications deployed on virtual machines that are provisioned as IaaS Azure Resource Manager virtual machines. Backup products with access to the guest operating system (OS) can easily protect file, folder, OS state, and application data using similar policies you use today for near-line and long-term retention. You have the flexibility to use Microsoft products like Azure Backup and System Center Data Center Protection Manager, and third-party products to back up data on-premises, to a service provider, or directly to Azure. This approach gives you the flexibility of choice for protecting your applications and data using products you are familiar with and trust. Applications that require minimal downtime and minimal data loss need additional protection. Backup and restore is ideal for customers that can tolerate application downtime for an extended period. However, to achieve minimal downtime, you need to replicate data to a secondary location and orchestrate failover of the application in the event of a disaster. With Azure Stack, you have the flexibility to use Azure Site Recovery to replicate data directly to Azure and failover your application to run in Azure, this feature is currently available in technical preview. Applications deployed on Azure Stack that support native replication, like Microsoft SQL, can replicate data to another location where the application is running. You can also use third-party replication and orchestration products to failover applications to another location. Like backup and restore, this approach gives you the flexibility and choice for protecting your applications and data. 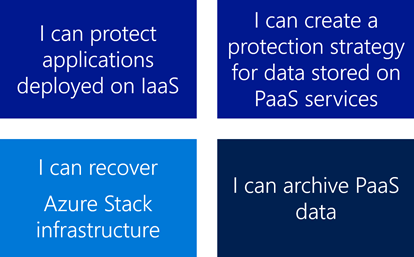 In-guest protection—Azure Stack only supports protection technologies at the guest level of an IaaS virtual machine. Azure Stack does not support installing agents on underlying infrastructure servers and does not rely on hypervisor-based technologies. Azure Site Recovery—Upon general availability of Azure Stack, the Azure Site Recovery technical preview will support failover to Azure, and test failover in Azure. To failback from Azure to Azure Stack, you will need to shut down the IaaS virtual machines, manually copy the data to your Azure Stack instance, and then recreate the IaaS virtual machine. At that point, you can enable protection for the IaaS virtual machine as a new instance. 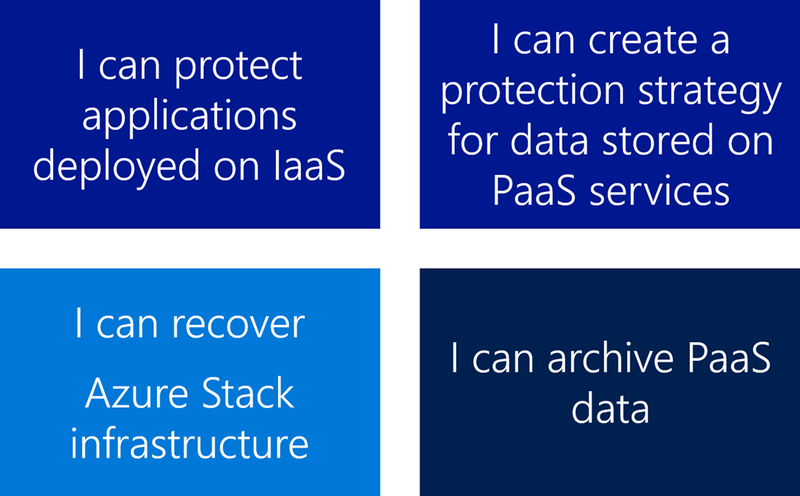 Site to site protection—Protecting IaaS VM resources across two Azure Stack clouds is supported using the Azure Backup Server or a third-party product from one of our partners. Your BC/DR planning must prepare your company to recover from a disaster that permanently takes your entire Azure Stack cloud offline and results in complete and unrecoverable data loss. Deploying your Azure Stack cloud will require you to engage your hardware vendor. If you have a secondary site, consider deploying an Azure Stack instance there, which will allow you to recover tenant applications and data without having to wait for a new cloud to be deployed. Download and install ASDK today and get familiar with hosting your applications in a hybrid cloud. As you gain insight into the applications that you plan to deploy into Azure Stack, think through the recovery objectives for your applications. Identify the different protection schemes that make sense, and consider the technologies and products that will help you achieve these objectives. Reach out to your vendor to discuss how they will support BC/DR scenarios on Azure Stack. Start testing application and data protection on ASDK. As we get closer to general availability, you will see updated documentation about Azure Stack. If you want to talk to the Azure Stack product group about BC/DR, fill out this surveyso we can reach out to you. We always want feedback—please sign up to talk to us.